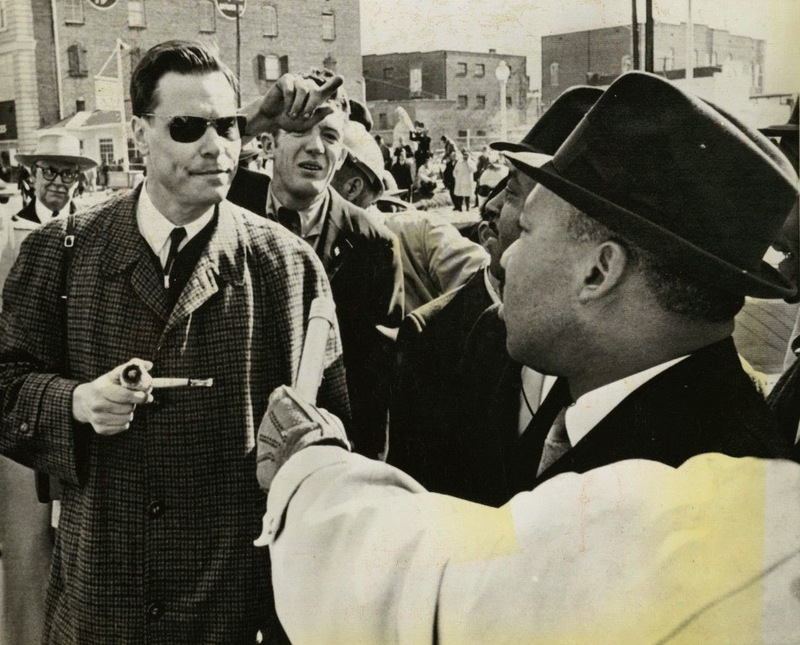 George Lincoln Rockwell, head of the American Nazi Party, confronts Dr. Martin Luther King, the 1964 Nobel Peace Prize Winner, in front of the Dallas County, Selma, Alabama. Both Rockwell and King agree to hold a debate later that evening. Rockwell was barred from the evening meeting because King was supposedly assaulted earlier that day by National State’s Rights Party activist James Robinson. Within three years of this confrontation, both of them would be assassinated. King and other prominent civil rights leaders led several hundred Blacks to the courthouse to launch a voter registration drive. This voter registration drive was an effort undertaken by Martin Luther King (and The National Association for the Advancement of Colored People) to register to vote the Black population who were eligible but still not registered. The American Nazi Party (ANP) was an American political party founded by George Lincoln Rockwell. Rockwell initially called it the World Union of Free Enterprise National Socialists (WUFENS), but later renamed it the American Nazi Party in 1960 to attract maximum media attention. The party was based largely upon the ideals and policies of Adolf Hitler’s NSDAP in Germany during the Third Reich but also expressed allegiance to the Constitutional principles of the U.S.’s Founding Fathers. It also espoused Holocaust denial. The American Nazi Party was focused on racial separation and George Lincoln Rockwell felt that the Nation of Islam and Elijah Muhammad had compatible ideas about racial separation and Jewish conspiracy theories. They achieved a sort of alliance with the Nation of Islam. They even attended one of their meetings, producing an iconic image of George Lincoln Rockwell and two other white supremacist sitting in the first row of a Black Rally.